EquityEats: An innovative restaurant crowdfunding platform | Everything Delicious. 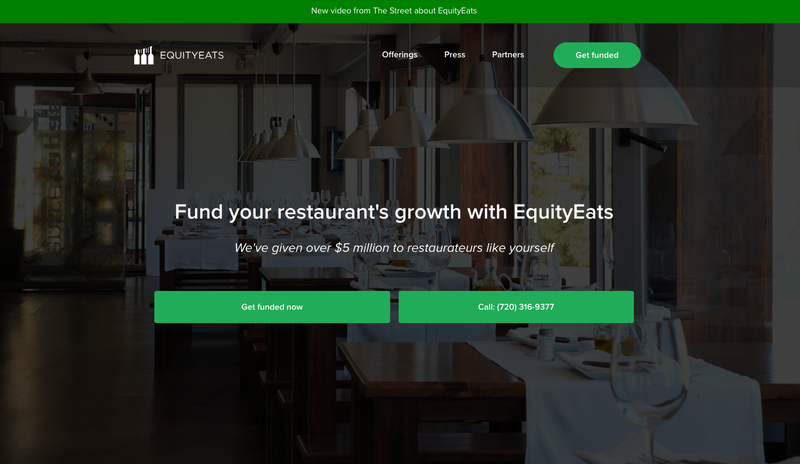 EquityEats is a little bit like a kickstarter but with 2 main differences: 1. it specializes in restaurants 2. it doesn’t help them start their business, but expand it. Otherwise, it’s pretty much the same, relying on a crowdfunding mechanism to fund restaurant owners’s projects. How does it works exactly? It’s pretty simple. If the small business qualifies (which means – it needs to exist, to not be in debt, and to have a community of Facebook fans or an active email list) then the owners can ask for cash upfront for their project or expansion needs. In exchange, they provide the platform with gift certificates for their restaurants which consumers can buy online or through the app at an attractive cost. Brilliant indeed because at the end of the day, it’s way less costly for restaurants to pay back their loan in food than it would be in cash. And that was the idea of the founders of the platforms, restaurant owners themselves. Their idea all along was to help others escape the arduous and expensive journey of borrowing from a bank, by asking support from their community and existing customer base instead. A pretty smart move which seems to be working as EquityEats provided restaurants more than $4 million in funding last year, and projects to double that in 2017. This entry was posted on April 6, 2017 by Pauline Rosen in News feed and tagged crowdfunding, innovation in food, restaurant funding.